Beku Beku shashvata neero (We want a permanent source of water)!” For the past five months, Kolar, a district in Karnataka, has been reverberating with this slogan. 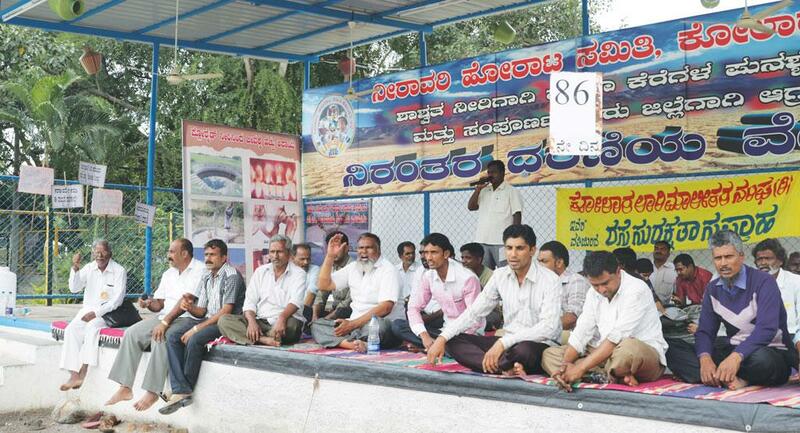 Every day, hundreds of farmers and traders gather at College Circle in Kolar town to protest an acute shortage of water, which resulted in a 50 per cent crop loss this year in the district. Kolar is ranked highly among all the districts in the state in productivity and yield of horticultural crops. But the protest has landed on deaf ears as nobody from the state government has acknowledged it, forget about visiting the site. This forced many farmers to abandon agriculture and migrate to Bengaluru. 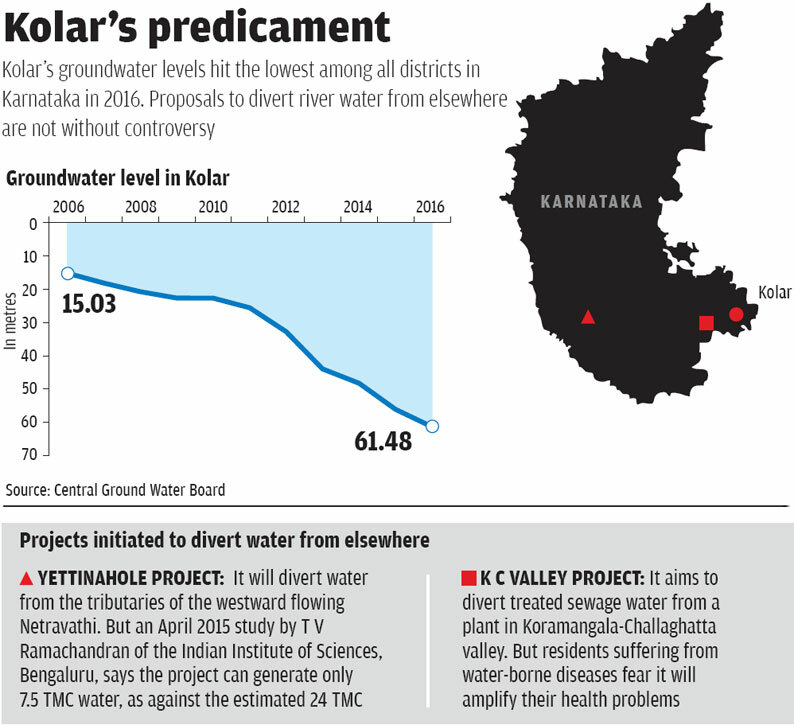 For more than a decade, Karnataka has been overexploiting its groundwater. In 2006, Kolar’s average groundwater level was at a depth of 15.03 m. This year, from January to August, it dropped to 61.48 m. It now ranks the lowest among all districts in the state. In fact, groundwater has been overexploited in all its five talukas, leaving no scope to further tap groundwater, which meets its irrigation and domestic needs. However, this is not the first time Kolar has witnessed such scarcity. Groundwater was overexploited in all its talukas in 2011. The eastern gateway to Karnataka, Kolar, has no perennial source of water. Although it is drained by three river basins—Palar, Ponnaiyar and Pennar—these rivers and their tributaries are small and carry water only during the rainy season. The semi-arid district receives an annual average rainfall of just 748 mm. The rainfall is also extremely erratic. While in 2005, the annual rainfall was 1,195.4 mm, in 2016 it was just 521 mm. In the absence of surface water and adequate measures to recharge water aquifers, farmers started digging bore wells in early 2000s, a practise which soon became rampant. In just four years, from 2011 to 2015, the number of bore wells in Kolar increased by 64 per cent. Although the Central Ground Water Board says Kolar had 84,287 bore wells—the highest in the state in 2015—Holali Prakash, a farmer from Kolar taluka and one of the leaders of the protest, says that this is a conservative estimate. It could be at least 125,000, Prakash says. Like Prakash, many farmers began abandoning water-intensive crops such as paddy and sugarcane, and shifted to mulberry, millet and vegetable cultivation. But this was just the beginning of the water woes in Kolar, where the majority of the population depends on agriculture. With declining groundwater levels, bore wells too began to dry up. Chandrashekhar Jalakanta, an IBM employee who has been protesting daily, says of the 1,700 bore wells drilled by the district panchayat this year, 500 did not yield water. M Thippeswamy, senior geologist, groundwater department, Kolar, says that nearly 40 per cent of bore wells in the district—33,715 of the 84,287—are dry. As a result, people began digging deeper and the depth of a bore well increased from 91 m in the early 2000s to 548 m in some areas today. At present, the average depth of a bore well in Kolar is 393 m. At Rs 688,000 for drilling a 393 m bore well, the failure of 33,715 bore wells amounts to a wastage of Rs 2,319 crore. The water deficit has also been compounded by the plantation of eucalyptus trees. Each tree can extract 15 to 20 litres of water per day. Introduced by the state government in the 1960s under its afforestation programmes, the tree became popular in the 80s. Today, the majority of the district’s eucalyptus is found in two of its talukas, says MVN Rao, director of a local non-profit, Gram Vikas. For many farmers, the zero maintenance tree, which matures in seven years, provides lucrative returns. Prakash says while the investment on eucalyptus is Rs 8,800 per hectare (ha), the return is Rs 40,000/ha. V Govindappa, a farmer from Honnsettahalli village of Mulabagal taluka, who grows eucalyptus on 70 per cent of his 8 ha land, says it is like insurance for them. “We use the money from eucalyptus plantation to buy gold for our daughter’s marriage,” says Govindappa. Following studies which linked eucalyptus cultivation to the depletion of groundwater levels in Kolar, the state government in 1990 asked the forest department to restrict eucalyptus to degraded reserved forests and wastelands. But some farmers continued to grow eucalyptus plantation as the order did not prohibit its plantation on private land. To further prevent the depletion of groundwater, the forest department has been replacing eucalyptus trees with bamboo and tamarind since 2013. Each year, they remove eucalyptus from 1,000 ha of forestland. “We are going to ask the government to issue a blanket ban on eucalyptus plantations, including those on private farms,” says Srinivas Rao, district forest officer, Kolar. Though the district administration and the forest department have been trying out measures such as crop diversification, artificial recharge and water conservation, residents feel it is not enough. To discourage farmers from growing eucalyptus, the forest department distributed 0.8 million sandalwood seedlings and 0.6 million Melia dubia (Malabar neem) seedlings this year. Jalakanta, whose father grew ragi, says that the returns on sandalwood are more. Srinivas Rao says they are thinking of providing the seedlings at a subsidised cost. Jalakanta says this is much needed as sandalwood requires huge investments. Between 2010 and 2016, Kolar’s horticulture department assisted farmers in building 200 individual and 20 community farm ponds under the National Horticulture Mission. But it ignores the fact that the ponds are full only during the two rainfall months, says Jalakanta. Prakash says a permanent solution to meet Kolar’s requirements lies in diverting water from the rivers in the state. According to a 1972 report by G S Paramashivaiah, an irrigation expert, every year, 1,500 thousand million cubic feet (TMC) of water from the state’s major rivers such as the Krishna and the Cauvery drains into the sea. Kolar needs only 100 TMC annually, says Prakash. Although in 2015, the state government announced two projects to divert river water to Kolar, both drew the ire of scientists and citizens (see ‘Kolar’s predicament’). Shubha Ramachandran of Biome Environmental Solutions, a Bengaluru-based non-profit, says although diversion is a way out, it’s not the only solution. She points to the neighbouring Chikballapur district where residents filled up water tanks to recharge the aquifer. This ensured that water was available in open wells. A part of the problem can be solved by the revival of water bodies and judicious use of whatever water is available, she adds.